Step one: earn a college degree. Step two: get a job. Step three: make gobs of money. That's more or less the trajectory many of us strive to achieve as we venture into adulthood. It's why people bust their asses in high school to make it into a prestigious college. But as you'll figure out if you haven't already, having an Ivy League degree definitely doesn't guarantee you're going to bank fatter paychecks than your peers. 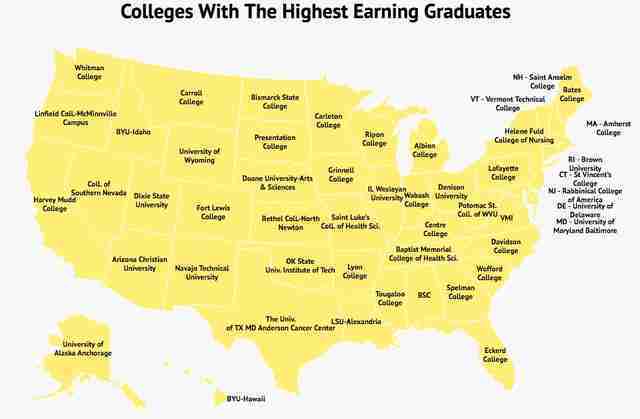 In fact, lots of lesser-known institutions turn out a surprising number of people who go on to make the big bucks, as proven by this brand new list of the colleges in each state with the highest earning graduates. The latest bit of analysis comes from the data team at career search site Zippia, who analyzed scores of data to determine which school in each state graduates the highest earners, on average. Specifically, they looked at the most recent College Scorecard data on four-year institutions, zeroing in on the mean earnings of graduates a decade after they first started school. 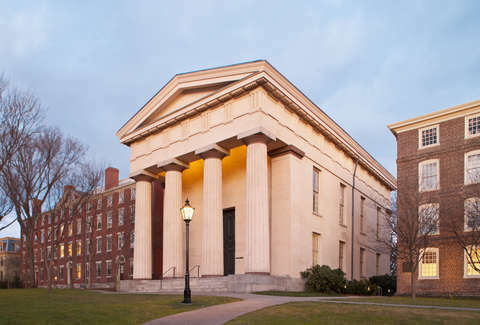 Interestingly, only one Ivy League school made the top 10 list, with Brown University coming in number two, behind the school that churns out the highest-earning graduates, on average, in the country: the University of Maryland Baltimore. Here are the schools that took the crown in each state, along with the average earnings of their grads. It's worth noting that the rankings did not factor in any community colleges, and that the College Scorecard's earnings data is somewhat limited. For example, it includes earnings data for students who ended up dropping out as well as graduates, and also only factors in data for students who received federal aid. It's also important to keep in mind that this ranking wasn't just a look at undergraduate programs and that many of the schools on this list have schools of medicine, law, and nursing, which could very well skew their earnings numbers upward. And while raking in a big ol' paycheck is obviously a nice bonus, if you're simply looking to land a job as a post-grad, these are the schools in each state most likely to help you do just that.